Background: Although there are many treatments for osteonecrosis of the femoral head, conservative treatment is often ineffective. Once collapse of the femoral head occurs, the damage is irreversible. Our previous animal studies have shown that local administration of zoledronic acid prevents collapse of the osteonecrotic femoral head. Additionally, bone marrow mononuclear cell therapy has a good short-term clinical effect on osteonecrosis of the femoral head. Currently, it is unclear whether a combination of bone marrow mononuclear cells and platelet-rich plasma may have efficacy in preventing early-stage collapse of the osteonecrotic femoral head. Methods/Design: A prospective, randomized, parallel-controlled, single-center clinical trial will be completed at the Chinese PLA General Hospital, China. One hundred patients with Ficat I-II osteonecrosis of the femoral head will be recruited and equally randomized into treatment and control groups. The treatment group will be given injection of enriched autologous mononuclear cells and zoledronic acid into the necrotic area following core decompression by drilling. In the control group, core decompression by drilling will be done, but no treatment will be given. Patients will be followed up at 3, 6, 12 and 18 months. Dynamic perfusion MR imaging, three-dimensional CT reconstruction, and anteroposterior and lateral X-ray observations of the hip joint will be performed to observe blood supply, bone formation and femoral appearance in the necrotic area. Harris score of the hip joint and a numeric rating scale score will be used to evaluate hip function and pain. These indicators will be used as primary outcome measures. Scores from the 36-Item Short-Form Health Survey and activity of daily living scale will be used as secondary outcome measures. Discussion: The outcomes of this trial will provide quantitative data and related information for evaluating the efficacy of local administration of enriched bone marrow mononuclear cells, platelets and zoledronic acid for the clinical prevention of collapse of the early-stage osteonecrotic femoral head. Trial registration: ClinicalTrial.gov identifier: NCT02721940. Written approval for this protocol was obtained from the ethics committee of the Chinese PLA General Hospital in China (approval No. S2015-082-01). QYG conceived and designed the trial procedure, JP collected the data, and NM wrote the paper. All authors read and approved the final version of the paper for publication. Osteonecrosis of the femoral head (ONFH) is a common degenerative disease caused by a variety of factors, such as trauma, alcoholism, use of corticosteroids, and systemic lupus erythematosus. In ONFH, the overall mechanical properties of the femoral head change over time, and collapse of the femoral head results in severe pain and disability (Pringle et al., 2004; Kim et al., 2005; Little et al., 2005). Although there are numerous strategies for treating ONFH, conservative treatments are often ineffective. Once collapse of the femoral head occurs, hip replacement is the only option for ONFH patients (Agarwala et al., 2009; Amanatullah et al., 2011). Therefore, it is important to reduce osteonecrotic weakening of the femoral head in the early stage of ONFH to prevent subsequent head collapse. Studies have shown that bisphosphonates inhibit osteoclast activity, reduce bone resorption, retain bone trabeculae (Kim et al., 2006), reduce apoptosis of osteoblasts and osteocytes, and promote new bone formation (Bellido and Plotkin, 2011). Therefore, we have chosen to use bisphosphonates for preventing collapse of the osteonecrotic femoral head. Zoledronic acid is the most potent bisphosphonate for the treatment of ONFH. It can reduce bone resorption and preserve the shape of the femoral head. In most cases, bisphosphonates are given intravenously or orally. However, systemic administration is associated with many complications, including osteonecrosis of the mandible and atypical femur fractures (Gou et al., 2014). As previously reported (Xu et al., 2013), poly(lactic-co-glycolic acid) acts as a drug carrier to facilitate the local release of zoledronic acid, and it has been found to promote bone formation and help avoid the complications caused by systemic administration. Using this method of administration, zoledronic acid can reach locally therapeutic levels, thereby preventing femoral head collapse. ONFH reduces the viability of bone marrow hematopoietic cells and bone cells to varying degrees, and can even induce cell death. Adult red bone marrow has two distinct parts; a hematopoietic section containing hematopoietic stem cells, and a mesenchymal section containing mesenchymal stem cells that promote bone regeneration. Core decompression technology can reduce intraosseous pressure, improve venous return, promote revascularization of the femoral head, and effectively reduce the symptoms of osteonecrosis; however, clinical efficacy is currently unsatisfactory, probably because of insufficient bone formation and repair (Lieberman, 2004; Mont et al., 2004). In recent years, the use of bone marrow mononuclear cells (BMMCs) has shown good short-term clinical efficacy in the treatment of ONFH (Yamasaki et al., 2010; Gangji et al., 2011). However, the long-term outcome is unknown, and it is not known whether combined therapy with platelet-rich plasma may be effective for the treatment of femoral head collapse in the early stage of ONFH. Here, we propose a prospective, randomized controlled trial to assess the clinical efficacy of local administration of enriched BMMCs, platelets and zoledronic acid for preventing femoral head collapse in the early stage of ONFH. This study is a prospective, randomized, parallel-controlled, single-center clinical trial that will be completed at the Chinese PLA General Hospital in China. One hundred patients with Ficat I-II ONFH will be enrolled and equally randomized into treatment and control groups. In the treatment group, patients will be given local injection of enriched autologous BMMCs and zoledronic acid into the necrotic area following core decompression by drilling. In the control group, core decompression will be performed, but no treatment will be given. Patients will be followed up at postoperative 3, 6, 12 and 18 months ([Figure 1]). Figure 1: Flowchart of the various stages of the trial. Dynamic perfusion MR imaging, three-dimensional CT reconstruction, and anteroposterior and lateral X-ray observations of the hip joint will be performed to observe blood supply, bone formation and femoral appearance in the necrotic area, respectively. Harris score of the hip joint and the numeric rating scale (NRS) score will be measured to evaluate hip function and the degree of pain. These indicators will be used as primary outcome measures. Scores from the 36-item Short-Form Health Survey (SF-36) and activity of daily living scale (ADL) will be used as secondary outcome measures. This study protocol was approved in writing by the ethics committee of the Chinese PLA General Hospital in China (approval No. S2015-082-01). Investigators or investigator-authorized officers will be responsible for explaining the benefits and risks of participating in the clinical trial to each patient, patient's legal representative or patient's relations, and their written informed consent will be obtained before the trial. The study protocol follows the Declaration of Helsinki, formulated by the World Medical Association. Computerized randomization will be completed by an investigator who will not participate in the trial using SPSS 22.0. Upon their visit, each patient will be given a random allocation sequence and randomized into treatment or control group. In the treatment group, through the precise positioning of the necrotic area by C-arm CT, autologous BMMCs and zoledronic acid will be injected following core decompression. In the control group, only core decompression will be carried out, with no injection. The allocation sequence table will be copied in triplicate, and inserted into sequentially numbered, opaque, sealed envelopes (to ensure that allocation is concealed from the assessor). All of the envelopes will be preserved by the designer, pharmacist and statistician (who is uninvolved in treatment and data analysis). Patients and assessors will be blinded to the grouping and intervention protocols, while surgeons will be aware of the allocation arm. After epidural anesthesia, bone marrow samples will be extracted using a bone marrow biopsy needle (6-8 cm in length and about 1.5 mm in diameter) and a 20 mL syringe. The needle will be inserted into the cancellous bone marrow cavity through the cortical region of the iliac bone, and 2-2.5 mL of blood will be extracted once every 90° rotation of the needle on the same plane. After a full 360° rotation of the needle, the extracted blood sample will be infused into the sterile blood storage bag containing sodium citrate and glucose. The puncture needle will be inserted into the iliac bone in different directions and depths (in a fan-like shape). 50-60 mL of bone marrow blood will be extracted separately using different skin entry points with an interval of 4-5 cm, and in total, 100-180 mL of bone marrow will be taken. The bone marrow blood sample will be mixed with an autologous peripheral blood sample for cell sorting using density gradient centrifugation at 3,000 r/min, for 5-10 minutes, on a COBE 2991TM Cell Processor (GAMBRO BCT. Inc., Lakewood, CO, USA). The whole blood sample will be centrifuged to produce a plasma layer, a buffy coat (BMMCs and platelets) and a bone marrow mature cell layer. Bone marrow mesenchymal stem cells will be enriched in the BMMC layer. The different fractions of the whole bone marrow will be removed and individually packaged. The volume of bone marrow blood in the BMMC layer [VE (mL)] correlates with two parameters; super out volume (SV, mL/min) and super out rate (RT, minute). The relevant formula is as follows: VE = SV × RT. The BMMC layer will be purified by real-time control, and concentrated to 30-50 mL for surgical injection. Additionally, a 2 mL aliquot of the blood sample used for injection will be taken for bacteriological testing. A 2-5 mL bone marrow sample will be extracted from each patient before and after extraction, from which 1-2 mL will be used for cell counting. The enrichment efficiency of BMMCs will be assessed according to blood marrow volume and the number of BMMCs before and after enrichment. BMMCs will be concentrated to 12.2 ± 3-35.2 ± 12 × 10 6 /mL. Patients in the two groups will lie on the orthopedic traction bed in the supine position. Under the C-arm X-ray machine, a 1.0 mm Kirschner wire will be percutaneously drilled into the necrotic lesion of the femoral head 2-3 cm distal to the subchondral bone plate, along which a trephine with a diameter of 3.5 mm (inner diameter of 1.5 mm) will be inserted for core decompression. In total, 2-3 holes will be bored. Then, in the treatment group, patients will be given 200 μg zoledronic acid and purified BMMCs will be injected into the necrotic zone, followed by injection of 5-10 mL normal saline. Finally, the holes for core decompression will be sealed with a small amount of bone wax to prevent leakage. The procedure for isolation and enrichment of BMMCs, and for their subsequent local injection (in combination with local zoledronic acid injection) is shown in [Figure 2]. Figure 2: Procedures for isolating, enriching, and injecting bone marrow mononuclear cells in combination with zoledronic acid local injection. The schedule for outcome measures is shown in [Table 1]. All patients will be followed up through the outpatient clinic at 3, 6, 12 and 18 months after treatment. Specially assigned workers will be responsible for the follow-up visits. If a patient fails to show up for the clinical follow-up, the patient will be contacted by telephone or home visit. To reduce the dropout rate of patients, the telephone number, address and e-mail of enrolled patients, their friends, family members and work units will be collected. If the loss of a patient occurs, his or her data will be carried over to the intention-to-treat analysis. The reason for the loss will be recorded in the patient's case and medical records. During the trial, inspectors will be responsible for monitoring adverse reactions in the patients. If any adverse reaction is observed during the follow-up, the patient will be urged to call their doctor for assistance. Predicted complications include fever, joint pain, joint snapping, joint noise, joint swelling, limited mobility, and itchy skin. Patients will be urged to inform their family members or close friends to observe for these symptoms and that they are participating in a clinical trial. If a patient has questions about participating in this trial, they will be informed how to contact their doctor. All serious adverse events will be recorded in detail-including the date of occurrence, duration, treatments, and possible relationships with the therapeutic procedures-and reported to the research director and the ethics committee within 24 hours. All the data will be collected on a case report form, including demographic information, disease diagnosis, and concomitant diseases. Data will be recorded electronically using a double-data entry strategy. After the follow-up, all the data will be checked and locked by the principal investigator. The locked data, which cannot be modified, will be saved for subsequent analysis. All the data relevant to this clinical trial will be saved by the Chinese PLA General Hospital. Then, the data will be statistically analyzed by professional statisticians, and the statistical results will be reported to the principle investigator who will be responsible for writing the research report. The Data Monitoring Committee (IDMC) will be responsible for data monitoring and management throughout the entire trial, to ensure scientific accuracy, authenticity, and integrity. Data will be statistically analyzed using SPSS 22.0 (IBM, Armonk, NY, USA). Measurement data that are normally distributed will be expressed as mean, standard deviation, minimum value and maximum value. Data that are non-normally distributed will be expressed as the lower quartile (q1), median and upper quartile (q3). Count data will be expressed as a percentage (%). Where appropriate, two-tailed tests will be used, with statistical significance set at P < 0.05. Baseline data will be compared between groups, and statistically analyzed using two-tailed tests at α = 0.05. Count data will be compared between groups using chi-square test or Fisher exact test. Measurement data will be compared between groups using t-tests, and nonparametric variables will be compared between groups using the rank sum test. Studies have demonstrated that core decompression combined with the transplantation of enriched autologous BMMCs is a suitable strategy for treating Ficat I-II ONFH (Wang et al., 2011). In this trial, bone marrow enrichment technology will be used to separate and purify BMMCs from mature red blood cells and plasma by density gradient centrifugation. 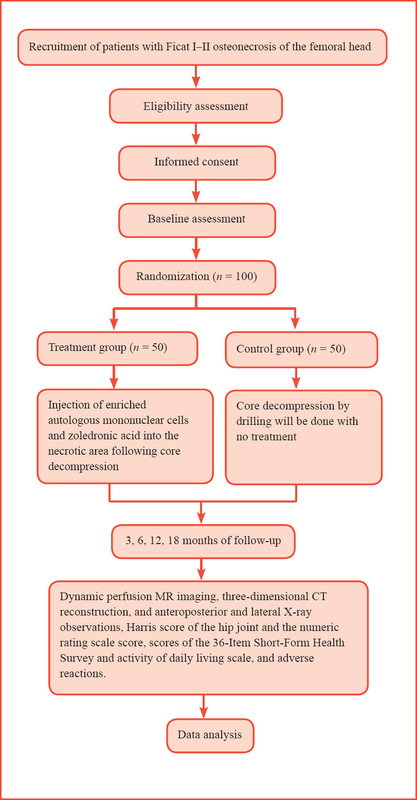 As previously reported (Hernigou and Beaujean, 2002), core decompression combined with autologous bone marrow transplantation is effective for treating early-stage non-traumatic ONFH. However, a sufficient number of cells for transplantation are crucial for osteogenesis. Bone marrow enrichment technology can substantially increase the number of BMMCs available for transplantation, thereby improving the therapeutic efficacy of BMMC transplantation in early-stage ONFH. Local application of zoledronic acid can inhibit osteoclast activity, promote osteoblast activity, block the pathological progression of ONFH, and enhance the mechanical properties of the bone to prevent femoral head collapse (Xu et al., 2015). However, outcomes have varied. A prospective, randomized controlled study of 110 cases of ONFH that were followed up over a period of 2 years was reported by Lee et al. (2015), and they found that intravenous injection of 5 mg zoledronic acid per year did not have therapeutic efficacy. However, in our current protocol, zoledronic acid will be administered directly into the necrotic zone. This proposed study will provide critical information on the therapeutic effectiveness of our treatment strategy, which combines the local transplantation of enriched BMMCs with zoledronic acid injection for the early prevention of femoral head collapse. Agarwala S, Shah S, Joshi VR (2009) The use of alendronate in the treatment of avascular necrosis of the femoral head: follow-up to eight years. J Bone Joint Surg Br 91:1013-1018. Amanatullah DF, Strauss EJ, Di Cesare PE (2011) Current management options for osteonecrosis of the femoral head: part 1, diagnosis and nonoperative management. Am J Orthop (Belle Mead NJ) 40:E186-192. Bellido T, Plotkin LI (2011) Novel actions of bisphosphonates in bone: preservation of osteoblast and osteocyte viability. Bone 49:50-55. Bijur PE, Latimer CT, Gallagher EJ (2003) Validation of a verbally administered numerical rating scale of acute pain for use in the emergency department. Acad Emerg Med 10:390-392. Gangji V, De Maertelaer V, Hauzeur JP (2011) Autologous bone marrow cell implantation in the treatment of non-traumatic osteonecrosis of the femoral head: Five year follow-up of a prospective controlled study. Bone 49:1005-1009. Gou W, Wang X, Peng J, Lu Q, Wang Y, Wang A, Guo Q, Gao X, Xu W, Lu S (2014) Controlled delivery of zoledronate improved bone formation locally in vivo. PLoS One 9:e91317. Hernigou P, Beaujean F (2002) Treatment of osteonecrosis with autologous bone marrow grafting. Clin Orthop Relat Res:14-23. Kim HK, Randall TS, Bian H, Jenkins J, Garces A, Bauss F (2005) Ibandronate for prevention of femoral head deformity after ischemic necrosis of the capital femoral epiphysis in immature pigs. J Bone Joint Surg Am 87:550-557. Kim HK, Sanders M, Athavale S, Bian H, Bauss F (2006) Local bioavailability and distribution of systemically (parenterally) administered ibandronate in the infarcted femoral head. Bone 39:205-212. Lee YK, Ha YC, Cho YJ, Suh KT, Kim SY, Won YY, Min BW, Yoon TR, Kim HJ, Koo KH (2015) Does zoledronate prevent femoral head collapse from osteonecrosis? A prospective, randomized, open-label, multicenter study. J Bone Joint Surg Am 97:1142-1148. Lieberman JR (2004) Core decompression for osteonecrosis of the hip. Clin Orthop Relat Res (418):29-33. Little DG, McDonald M, Sharpe IT, Peat R, Williams P, McEvoy T (2005) Zoledronic acid improves femoral head sphericity in a rat model of perthes disease. J Orthop Res 23:862-868. Mont MA, Ragland PS, Etienne G (2004) Core decompression of the femoral head for osteonecrosis using percutaneous multiple small-diameter drilling. Clin Orthop Relat Res (429):131-138. Pringle D, Koob TJ, Kim HK (2004) Indentation properties of growing femoral head following ischemic necrosis. J Orthop Res 1:122-130. Smith SW, Meyer RA, Connor PM, Smith SE, Hanley EN Jr (1996) Interobserver reliability and intraobserver reproducibility of the modified Ficat classification system of osteonecrosis of the femoral head. J Bone Joint Surg Am 78:1702-1706. Wang BL, Li ZR, Sun W, Shi ZC, Zhang NF, Yue DB, Guo WS (2011) The clinical research on treatment for nontraumatic ostenecrosis of the femoral head with the implantation of concentrated autologous bone marrow. Zhonghua Guanjie Waike Zazhi 5:426-432. Xu XL, Gou WL, Wang AY, Wang Y, Guo QY, Lu Q, Lu SB, Peng J (2013) Basic research and clinical applications of bisphosphonates in bone disease: what have we learned over the last 40 years? J Transl Med 11:303. Xu XL, Gou WL, Wang C, Yuan XL, Wang Y, Peng J, Lu SB, Guo QY, Wang AY, Xu WJ, Meng HY, Liu SY (2015) Prevention of femoral head collapse due to osteonecrosis in rats by local delivery of zoledronate via polylactic-co-glycolic acid. Zhongguo Jiaoxing Waike Zazhi 23:844-849. Yamasaki T, Yasunaga Y, Ishikawa M, Hamaki T, Ochi M (2010) Bone-marrow-derived mononuclear cells with a porous hydroxyapatite scaffold for the treatment of osteonecrosis of the femoral head: a preliminary study. J Bone Joint Surg Br 92:337-341.